It was another warm Friday night as I made my way to The Station Hotel, accompanied by my wife. Once again there was a bar extension, but with the schools breaking up for the summer holidays the preceding week I was expecting a small crowd. My expectations were correct, the pub was only a quarter full when I arrived. Yet, as I enjoyed my first pint of the evening, while the band checked volume levels, more and more people were arriving. That Friday's entertainment was provided by Chris Gledhill (gtr/ld vx), Mick Irving (gtr), Ian Adamson (bs/vx), Rob Ford (kys/vx) and Chris Stewart (dr) who collectively make up the popular local group The Light Alloy Band. To enhance the whole presentation of the group, the band use their own spot lights that bass guitarist Ian Adamson operates using a foot controller. Light Alloy go to great lengths to make sure that the atmosphere was just right, even removing a couple of bulbs from the pub's spotlights. With all the adjustments finished the band were ready to start. Their opening number was Bryan Adams "Run To You". A good 'up tempo' song to begin this set. It was clear that the band had worked hard on recreating the exact sound on Bryan Adams original recording. Chris Gledhill's vocals were good and powerful, Mick Irvin had a good 'overdriven' sound for his guitar, Chris Stewart's drumming was tight with many good 'fills', and at the correct volume, Ian Adamson's bass sounded good, although a little on the quiet side and Rob Ford's keyboard 'patches' were just right. We were in for a good evening, and, at the conclusion of the song, the applause was loud and long. No sound engineer is needed for Light Alloy as the Peavey PA amp is on stage, sat on top of the bass amp, yet their sound is nicely balanced (take note Full Circle). The highlights from their first set was a good version of Duran Duran's "Ordinary World", with some fine playing from Mick Irvin using, initially, his acoustic guitar (which could have been a little louder), and then concluding the song on his electric guitar, and, Three Dog Night's "Mama Told Me Not To Come" with some nice work on the keyboard by Rob Ford. The first set was concluded with another Bryan Adam's song, "Summer Of 69". After a short break the band begun their second set. The highlight of which was an entertaining version of Joe Cocker's seductive "Keep Your Hat On", with Chris Gledhill singing to, and dancing with, female members of the audience. Light Alloy's final song, Van Halen's "Jump" showed off Rob Ford's keyboard skills. The audience would not let Light Alloy end it there. So after lengthy applause and loud shouts of "More!" the band obliged by playing two more songs, Billy Idol's "Rebel Yell" and "White Wedding". It had been a good, entertaining evening, with the audience up on the floor dancing for most of the band's second set. 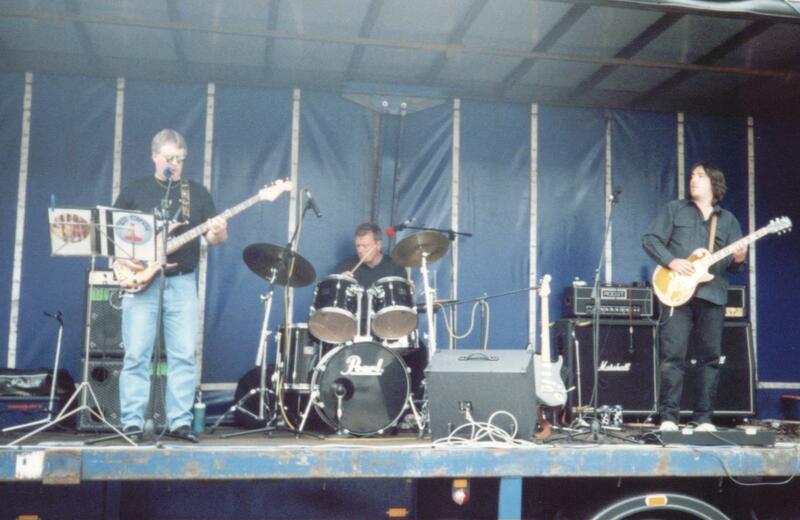 Light Alloy are a fine local band, who enjoy performing, and give a good, entertaining performance. 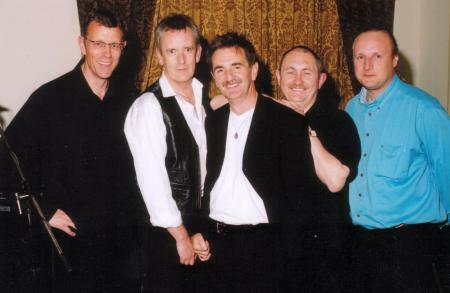 Ian Adamson's often humorous comments showed that the band don't take themselves too seriously. I look forward to the next time I see them play. Friday 12 Jul 03 was a warm evening, and what's more there was a bar extension! So I expected a large crowd to be cramming into the Station Hotel as I arrived, at around 9:45 pm. Sadly the main bar was almost empty; not a good sign. Well, the evening got off to a good start with a pint of Flowers at just £1.35! (Is there a pub selling a good pint of beer at a better price?) And, free live music too! Well done the Station Hotel. As I enjoyed my cool pint, the band were playing background music through their PA. A nice rig with Marshall tops and Peavey bass bins. The band also had their own sound engineer. The Lynyrd Skynyrd track sounded good, a nice 'clear' and 'clean' sound. All the signs were good and I was now in the right mood to enjoy the live entertainment. The band returned to start the second and final set. 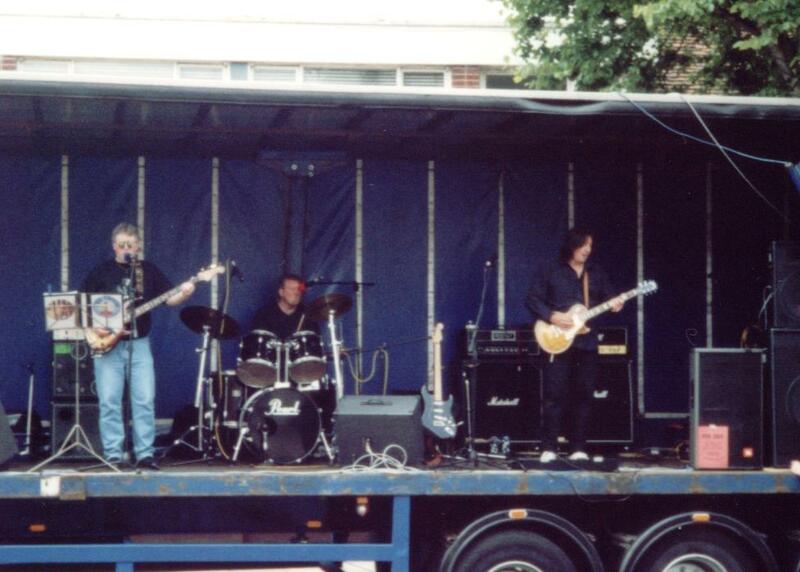 Full Circle are a Stevenage / Hitchin based three piece rock and blues covers band - comprising lead guitar, bass guitar/vocals and drums. The guitarist, Stephen Cropley, uses both a Fender 'Strat' and Gibson 'Les Paul' through a Marshall amp with two 4x12" cabs and various effects pedals. The bass guitarist, Kevin Crase, uses a Fender precision (new model) with a state of the art Trace Elliott bass combo. He is also the groups lead vocalist. Drummer, Graeme Law plays a Pearl kit. Ah, good, the band are about to start. The drummer counts them in 1-2-3-4, and the music begins. Full Circle's opening number for this set was The Rolling Stones' "Jumpin' Jack Flash". A good raunchy lead guitar sound, the band seemed 'tight', but something was wrong. Something didn't sound right. The band weren't too loud for the venue, often a problem with some bands, in fact the overall volume was just right. So what was wrong? Surely their sound engineer would sort it out? But she didn't! With a more critical ear I noticed that the bass guitar was too quiet. Only notes played on the low 'E' string cut through! Notes played on the 'A' string could just be heard, but, any note played on the 'D' or 'G' strings could hardly be heard at all! Also, the bass drum couldn't be heard 'punching' the rhythm along. That was most surprising as it was 'miked up' through the PA.
On closer inspection I noticed that all the instruments were put through the PA. Standing close to the bass guitar amp and left PA speaker the only instrument I could hear clearly was the lead guitar - that was on the opposite side of the 'stage'! Did the lead guitar need to be put through the PA for a small pub gig? Okay for the Birmingham Arena, but possibly a little 'over the top' for pub gigs, especially when the guitarist was using two Marshall four by twelve cabinets. Enough volume for a venue six times the size of the Station Hotel! Kevin's lead vocals, were also, sadly, a little weak. He 'got away with it', but, maybe an additional lead vocalist who can share the vocals is needed. Graeme Law, the drummer had a mike but rarely sang into it. When he did he couldn't be heard. Was it plugged in and the fader up? Kevin, the bassist was also the bands compare, but, sadly, his personality just did not come across to the audience. His 'nervous' laugh after every comment soon became irritating. Full Circle performed numbers that the audience knew. Including such songs as the blues standard "Walking", "Alright Now" (The Free classic), Jimi Hendrix's "Hey Joe", Z. Z. Top's "Smart Dressed Man" and others. It was only on "Alright Now" that the bass drum could be heard. In fact it was a little too loud on this song. Why could it not be heard until that song? It was being 'miked up', so it should have 'cut through'. That should have been corrected by the sound engineer, with an adjustment of the mixer fader. To sum up, I was disappointed with the band. Especially as they have been regularly gigging with the same line-up for over four years. Stephen Cropley, the lead guitarist played some excellent solos. The drummer, Graeme Law's timing was good, although he could have played a lot more 'fills' during songs to 'pad out' the overall sound. As regards presentation, Stephen and Graeme looked like rock musicians, but, why did Kevin wear such hideous, scruffy shorts. Come on Kevin, at least look the part. If you want to wear socks with trainers, wear white sports socks, not black. Hopefully Full Circle can sort out the sound imbalance and presentation before I see them the next time.